It must be a shock seeing a snake along the streets of Singapore, let alone Orchard Road. 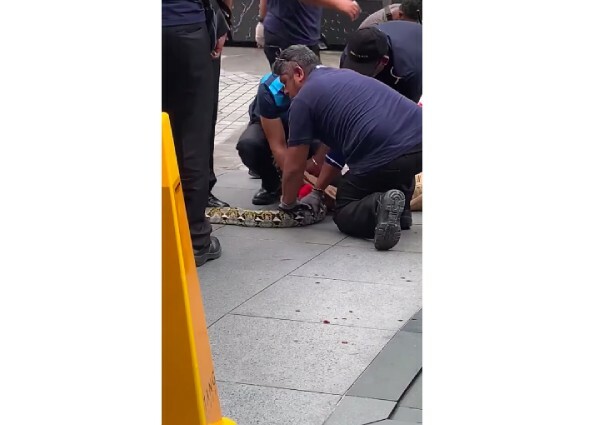 Readers told The Straits Times that they saw a large snake outside Tang Plaza at around 9am. Housewife Tess Fernando, 49, told ST that her son saw it on his way to school in the morning at around 8.20am, and had sent her a photo of the snake. In a video provided by Ms Fernando, at least five men can be seen struggling with the large snake as it thrashes about, resisting capture. It is a reticulated python. It is not known what has been done to the reptile after the men carried it away. Most of the men handling the snake wore shirts indicating they are from Anticimex, a pest control firm. But an Anticimex spokesman said it could not comment on the incident. Earlier this month, The New Paper reported that a family found a python in the toilet of their Housing Board flat in Eunos. Last October, a woman was bitten by a python outside her Sembawang Drive home. The Agri-Food and Veterinary Authority (AVA) advised members of the public not to handle or attack any snake they encounter. “Snakes would rather not encounter humans, and it is probably as scary for them as it is for you,” AVA’s advisory said.